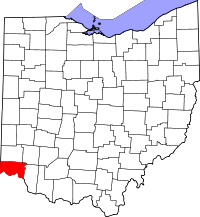 For the unincorporated community in Ottawa County, see Forest Park, Ottawa County, Ohio. Forest Park is located at 39°17′11″N 84°31′13″W﻿ / ﻿39.28639°N 84.52028°W﻿ / 39.28639; -84.52028 (39.286408, -84.520363). According to the United States Census Bureau, the city has a total area of 6.48 square miles (16.78 km2), all land. Forest Park was founded in the 1950s. According to historian James W. Loewen, it was founded as a sundown town; however, African Americans moved in beginning in 1967, and by 2000 Forest Park had become a majority minority city. As of the census of 2010, there were 18,720 people, 7,212 households, and 4,924 families residing in the city. The population density was 2,888.9 inhabitants per square mile (1,115.4/km2). There were 7,854 housing units at an average density of 1,212.0 per square mile (468.0/km2). The racial makeup of the city was 24.9% White, 65.0% African American, 0.2% Native American, 2.2% Asian, 0.2% Pacific Islander, 3.9% from other races, and 3.6% from two or more races. Hispanic or Latino of any race were 6.4% of the population. There were 7,212 households of which 35.8% had children under the age of 18 living with them, 40.8% were married couples living together, 21.9% had a female householder with no husband present, 5.5% had a male householder with no wife present, and 31.7% were non-families. 26.6% of all households were made up of individuals and 7.3% had someone living alone who was 65 years of age or older. The average household size was 2.59 and the average family size was 3.13. The median age in the city was 35.8 years. 26.9% of residents were under the age of 18; 9.1% were between the ages of 18 and 24; 26.2% were from 25 to 44; 26% were from 45 to 64; and 11.7% were 65 years of age or older. The gender makeup of the city was 46.4% male and 53.6% female. As of the census of 2000, there were 19,463 people, 7,505 households, and 5,238 families residing in the city. The population density was 2,990.4 people per square mile (1,154.3/km²). There were 7,748 housing units at an average density of 1,190.4 per square mile (459.5/km²). The racial makeup of the city was 36.70% White, 56.26% African American, 0.11% Native American, 3.67% Asian, 0.08% Pacific Islander, 0.99% from other races, and 2.20% from two or more races. Hispanic or Latino of any race were 1.48% of the population. There were 7,505 households out of which 34.0% had children under the age of 18 living with them, 50.4% were married couples living together, 15.6% had a female householder with no husband present, and 30.2% were non-families. 24.9% of all households were made up of individuals and 5.3% had someone living alone who was 65 years of age or older. The average household size was 2.58 and the average family size was 3.12. In the city the population was spread out with 27.1% under the age of 18, 8.4% from 18 to 24, 31.9% from 25 to 44, 23.6% from 45 to 64, and 9.1% who were 65 years of age or older. The median age was 34 years. For every 100 females there were 92.3 males. For every 100 females age 18 and over, there were 88.0 males. The median income for a household in the city was $49,298, and the median income for a family was $55,618. Males had a median income of $38,682 versus $28,454 for females. The per capita income for the city was $21,820. About 5.1% of families and 6.0% of the population were below the poverty line, including 8.2% of those under age 18 and 7.3% of those age 65 or over. The Winton Woods City School District covers most of Forest Park, along with Greenhills and Springfield Township. Forest Park is served by a branch of the Public Library of Cincinnati and Hamilton County. ↑ "Hamilton County Officials 2016" (PDF). Hamilton County Board of Elections. 27 January 2016. p. 11. Retrieved 1 February 2016. 1 2 "American FactFinder". United States Census Bureau. Retrieved 2008-01-31. ↑ "Profile of General Population and Housing Characteristics: 2010 Demographic Profile Data (DP-1): Forest Park city, Ohio". U.S. Census Bureau, American Factfinder. Retrieved October 30, 2012. ↑ Loewen, James W. (2013). Sundown Towns: A Hidden Dimension Of American Racism. The New Press. p. 514. ISBN 1595586741. ↑ "Forest Park Branch". Public Library of Cincinnati and Hamilton County. Retrieved 12 June 2014.